So after a horrible night with C last night (I suspect due to more teething) I've decided I need to get him a Baltic Amber teething necklace. We've been using Hyland's teething gel, but it only works for about 15 minutes and then he's screaming again. 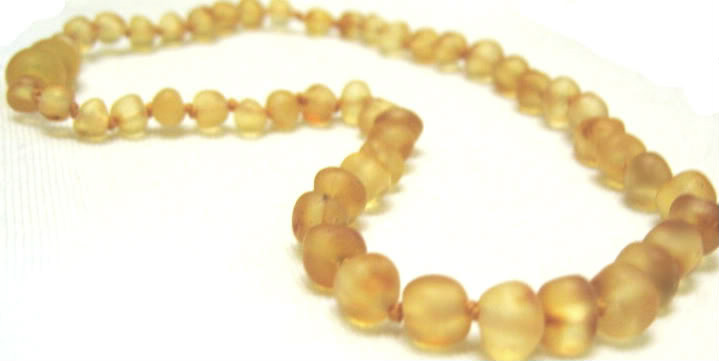 I've read lots of good things about the Inspired by Finn Baltic Amber teething necklaces. Also, every time they're on Baby Steals, they sell out in about two seconds, which says something! From the reading I've done (lots of helpful info on the Inspired by Finn site) I've learned that raw amber, and light amber contain the highest amounts of succinic acid (the component that relieves pain associated with teething). Since I read that, I want to get this necklace for C, since it seems like it will be the most effective. And it's cute too! He's going to be one good looking baby (well he is already, but you know). Oh, and let me add: Our trip to Maine was fun and guess what?? I was sitting there in the hotel room and decided to Google "cloth diaper kittery" and I found out there was a cloth diaper store RIGHT next to our hotel, like I'm talking within a super short walking distance. Can you believe it? On their website I saw that they had Ruby Moon detergent, which I've been wanting to try, and then guess what else? They were CLOSED! Ugh! I was so sad. I guess we'll have to go back to check it out. It was the Sweet Cheeks Cloth Diaper Co. I've definitely considered getting one of these. Our son is just miserable during those intense bouts of teething pain so I am always on the lookout for options. I'd love to hear how this works out for you guys! I just bought it! I'll definitely let you know how it works! Okay so I know you wrote this like forever ago but it was "recommended" to me on another post you wrote and I am a FIRM believer in amber teething necklaces so I had to see what you had to say. My little boy has been wearing one since he was three months old and has had very little teething side effects. I seriously swear by the amazing little things!! I hope it helped your boy too! We are now open by appointment as well as our regular hours. Stop by sometime and see us again! We tried a baltic amber teething necklace for our son and I was surprised it worked so well! I was a skeptic at first, but no longer =) Love the blog, keep the posts coming! The baltic amber baby teething necklace was a gift at my baby shower and I was definitely skeptical, but a desperate mommy will try everything and anything when her little one is in pain. Hallelujah, it worked! !